Havana Brown Cat – Very Brown Cat! 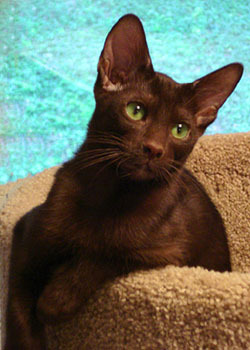 The Havana Brown Cat is a hybrid cat, developed with careful planning for a specific genetic design. The aim was to produce a self brown cat. While the breeding suffered during the World Wars, it was taken up with gusto in the post war period. The name Havana Brown has been used to describe the color genetics for self browns. On the other hand, some believe that it was called Havana because it matched the color of Havana cigars. This breed is also called the ‘Swiss Mountain Cat’. There are no specific types of Havana Brown cats. The first noticeable feature of the Havana Brown cat is its glistening mahogany colored coat, which is smooth, luxurious and closely cropped. The other distinctive feature is the head which is longer than it is wider. It has a prominent nose and beautiful oval shaped green eyes. Its body is firm and muscular and they are typically heavier than they look. There are no markings on their body. Havana Brown cats have a charming personality and a melodious voice. They are playful and they often use their extended paw to reach out and touch and feel out curiosities. They also use similar gesture to get the attention of humans. They like human company and can generally adapt to most situations.